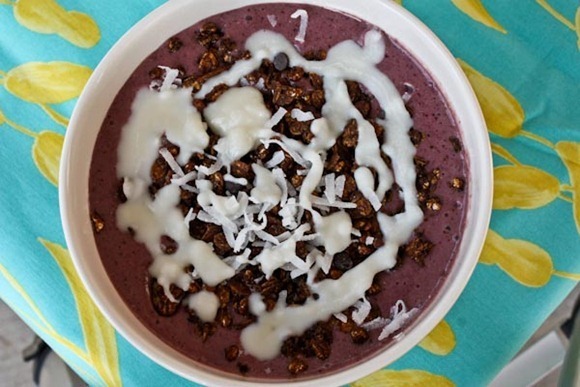 Toppings: Nuts About Granola chocolate mint cookie, coconut, coconut butter magic shell! 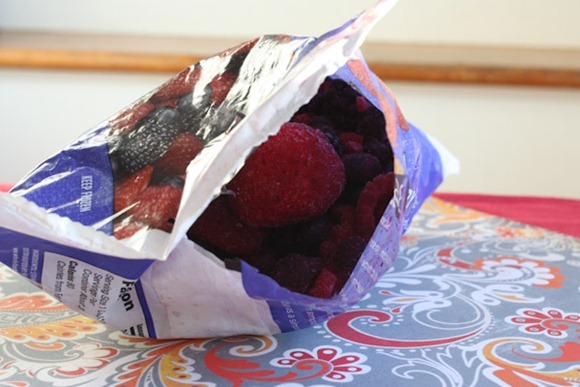 The frozen berries came from Whole Foods – their frozen mixed “Fruit Loot" that they sent me a coupon to try. This blend is a classic mixed berry – good as ever! All the necessary favorites. I thought the chocolate mint cookie granola was really unique. It’s very strong on the mint – almost like chewing gum. My first bite was too much, but then it softened up and I really liked it on this chocolate smoothie base! Last night I tossed and turned, which was directly related to having 1.5 cups of regular coffee yesterday. I am SO SENSTIVE to caffeine!! Normally we do 2/3 caf, 1/3 decaf, but with a new blend in the house, we went all caf. I always hope it won’t affect me and I am always wrong! 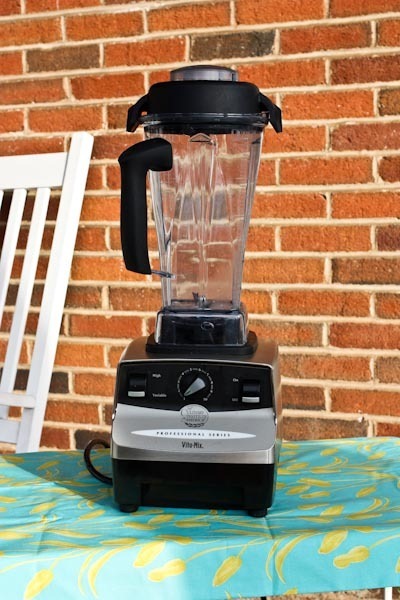 Continuing the awesomeness of OpenSky’s culinary generosity, win a Vita-mix! Winner to be announced on Friday!! 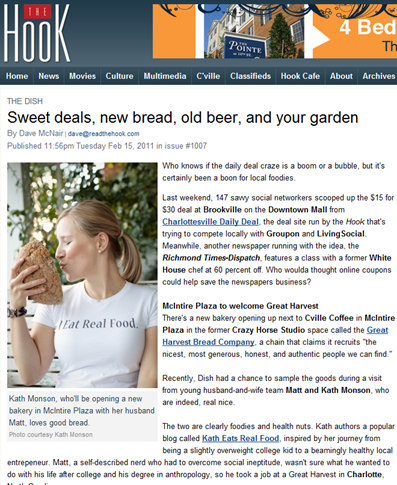 Read our bakery opening announcement on Cville’s The Hook! Only mistake is that my last name is Younger, not Monson, which is Matt’s name! 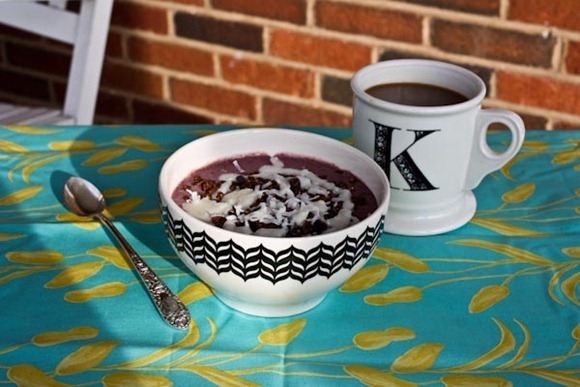 I have that K mug from Anthropologie, too! 🙂 Love it! I looove the frozen fruit from Whole Foods. It’s one of their items that’s not too pricey, either! That looks delicious! Oh man…lucky winner, whoever gets it! I LOVE my vitamix!! 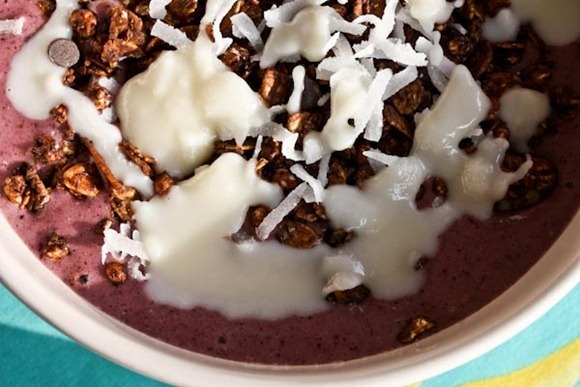 Holy amazing, that bowl looks deliiiiicious. I’ve been meaning to ask you for a while, what’s your opinion on the whole is-coconut-good-or-bad-for-you debate? I’ve been seeing more and more coconut butter making its way around the blogosphere lately, and while I loveloveLOVE coconut, the high saturated fat content makes me sqeamish. Obviously everything should be enjoyed in moderation, but as an RD are you of the mindset that coconut fat is a “different” kind of fat? So, better for you? I’m interested in your opinion!! I buy the same frozen blend from Trader Joe’s for much cheaper! It’s great that your future business is getting all of this press! I bet your shop will be packed the first week of opening 🙂 So exciting! I love the description of you as a, “beamingly healthy local entrepreneur” 🙂 The recent giveaways here have been amazing — maybe this will be my lucky week. Loved reading about your successful dentist trip via bike yesterday — I also chose a dentist within biking distance — so convenient! Nice give way! I love mixed berries in cobblers! They make the best cobblers ever! I hope you ahve a great day…congrats on the article! I know you guys must be getting excited! Great article…minus the wrong name thing. People do that to me all the time as well! Question – was Matt okay with you keeping your name? When I told my hubs that I planned on keeping mine, he was kinds of mad/disappointed. I like my last name a lot, and I would never change it, so I ask people why should I expect the same from her? And Younger’s a cool last name! Love your reply Matt! Spot on 😀 BTW, I am hoping (and praying) that Great Harvest makes it to Orlando someday. Whoop! Best response ever. I think my husband was just a little sad/caught off guard when I informed him of my intentions. I’m getting married at the end of the year, and have expressed to my husband-to-be that I would like to keep my own name or at least hyphenate/combine both names. The biggest obstacle/problem seems to be the name that our children would carry. He’s afraid our kids would be picked on if they had a hyphenated last name, which doesn’t make much sense to me. If it’s not too personal to ask, Matt/Kath – are you guys planning to have children and if so, what’s your plan for their surnames? We really don’t know for sure what’s going to happen yet. But LOTS of kids are hyphenated these days. I seriously doubt they will get teased unless your names are both super long and/or funny together. We will likely end up hyphenating because it seems like the most fair thing to do. We know for sure we’re not going to just choose one of our last names – we want our kids to have both somehow. The question is how! Looks yummy! Unfortunately we don’t have a Whole Foods or TJ’s around here. But we do have an Earthfare, I just haven’t been to it yet. Too bad about the name mistake — I changed my last name so I don’t know how I’d feel about seeing those types of mistakes. I would so love to win the Vita Mix. I’ve got my fingers crossed big time!!! Great article – though sorry about the name mistake. I did not change my last name when I got married, and people always assume I have and call me by my husband’s last name. Mmmmm… this is almost exactly my pinky V-Day meal except I added a scoop of chocolate-hazelnut spread. I should have though to add some chocolate powder too! I never wold have thought to add mint but it sounds super refreshing! Woah — your giveaways have been pretty stellar lately. Except for the fact that I haven’t won — that’s a little less awesome…..
PS It smells like spring here in Prescott, AZ too! Oooh, mint with breakfast sounds great. I put it in a smoothie once and it was awful…haha SO exciting about the article!! I want a vitamix so bad! Is it open to Canadian followers as well? Oooo a Vitamix! Awesome giveaway! Vitamixes are AWESOME! My mom has one and I use it every chance I get. I never realized you didn’t take his last name? Did you do a backstory on this?? Also, I love my last name! Very interesting, Kath! I also love my last name…and middle name. Not sure what I’m going to do when that time comes for me! I love my last name it’s association with my family, too. And I wanted to actually USE my last name, not have it stuck as my middle name. I ended up hyphenating, bc I also wanted to include my “new” family with my husband in my name. It gets annoying sometimes because people don’t understand that I have ONE last name and think they can use one or the other. Or call me Mrs. Ryan X, which I haaaaate – there is no woman here by that name OR title, thanks! We are going to go with just his last name for kids, though – I want them to have the option of hyphenating when they grow up, which gets messy if they already have a hyphenated name. I always love hearing about what everyone does with their names and kids’ names after marriage – fascinating reasons and back stories! Congrats on the press! When are you planning to open? nice looking article. That smoothie looks like one of the best combo’s. Great press, but sad they didn’t get the last name right. I kept my name also and it can be frustrating to be called by the wrong last name. Fingers are crossed for the Vita-Mix!! Nearly 30 years ago my mom didn’t change her last name when she married my dad. It didn’t really bother her when people called her by my dad’s last name b/c she realised that it was an easy mistake to make. Her last name is my (and my sister’s) middle name. Ooohh, I want that VitaMix so bad!!! All we have to do is subscribe to your blog?? I think I did that a couple of weeks ago. Should I be getting e-mails from your shop? The only e-mail I’ve received so far is one telling me I didn’t complete the sign-up process, but when I log in it shows I’m following you. I don’t know if I’m signed up or not. Congrats on the feature for the bakery! I already follow you on OpenSky so cross your fingers! Ooh I hope I win! Exciting! As recently as 3 mos ago I would have sworn that I was not sensitive to caffeine. I was having sleep issues and I kept reading that you shouldn’t drink anything with caffeine late in the day. For a long time denial reigned and I refused to try to get off the stuff. Now I’m completely off caffeine and my sleep has improved a great deal. Coincidence? I doubt it. You had me until mint! Not sure if I’d like it with berries. Congrats on the bakery opening announcement! I’m really sensitive to caffeine too! Not only does it make me jittery, I feel sick to my stomach too. I always have to get decaf! So exciting! I love your t-shirt in that picture, too. I can’t wait for you to open! I love it when berries turn breakfast cereal purple!! Absolutely makes my morning more sunny and delicious:) Congrats on the article girl! it’s the giveaway i’ve been waiting my whole life for!!! I just bought a few packs of Vega smoothie mixes – can’t wait to try them! 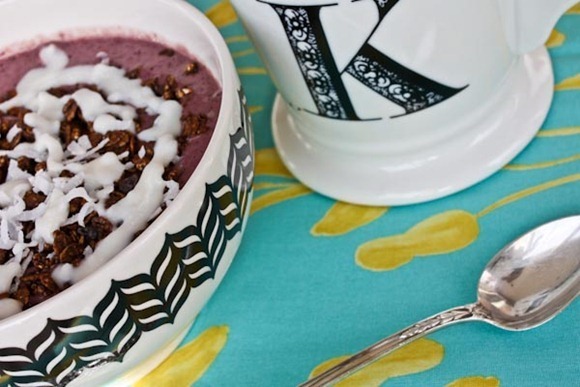 You’ve totally converted me to oatmeal – next stop: SIAB! And I’m a little belated – but when I got my O magazine in the mail last week, I was flipping through and saw the oatmeal piece and thought “this sounds just like KERF” and then I saw that you had written it! Congrats!! I like the slightly new layout today. Sad that Matt isn’t in the pic with you. Funny that you are kissing the bread. Just curious, why didn’t you take Matt’s last name when you got married? Right on, is right. 🙂 I love that you didn’t take Matt’s last name just because society says you were supposed to. And I love that he’s so cool with it. My bf and I don’t plan on getting married, but I’ve already told him I’m keeping my last name if we change our minds. Are you going to continue with giveaways? Or will they stop once you reach a certain number of followers on OpenSky? I’m going to keep going until they tell me I have to stop! Congratulations on the announcement in The Hook! I’m really loving the updated layout, by the way!! I just subscribed yesterday. I was impressed that you were a registered dietician. I should have looked around a bit more. I’m not impressed with the product push. Vega whatever isn’t a food. And that bag of greens you bought yesterday is not cheaper than buying the equivalent amount of fresh. That’s misinformation that you’re putting out here, and no matter how convenient it may be (we all like convenience) I’m not interested in reading what amounts to advertising passing as editorial. Yes, I have now read your disclaimer that you won’t praise something you don’t like. Not good enough. Is there a professional association for Virginia RDs? They should be notified about what you’re doing. Seems a bit harsh to me. $1.99 is most definitely cheaper than $6-9 for the greens – think of them once they cook down. I will continue to buy the product! You don’t have to continue reading here..
Kath, I have to tell you I’ve been following you for a year + and finally have something I have to say, besides that I want to steal your life! As I was closing my eyes last night a late night idea popped into my head that I couldn’t ignore! I happen to have some crushed pineapple and “Humingbird cake” oatmeal suprise this morning fit the bill and my delirous pre-dreams! Thanks for all the oat inspiration! ( I hated oats before following your blog!). That berry smoothie looks divine and just appropriate for all of us biting at springs tails to hurry up and get here! And also couldn’t help but think that Vitamix blender would have made fabulous whipped “hummingbird” oats! Hmmm – so like pineapple, oats and ?? Honey? Pineapple, bananna, oats, and coconut oil with sunflower seeds and Cinammon! Couldn’t stop myself from a little nut butter for some extra body! Wow, that does sound amazing! Kath, you breakfast looked awesome this morning. I am going to have to start trying the smoothies as the weather gets warmer here. I wanted to share with you a big thanks. I found your blog around the first of the year and I have become a hug fan of you and your oatmeal. I now have the oatmeal most mornings during the week and I love all the crazy toppings I have come to love. It makes each bowl different and is my morning adventure. But most of all…it has helped me lower my cholesterol. In September is was 200 it is now 186. My LDL was 133 it is now 125. Plus I have lost 25 pounds. I am using your blog to try new salad toppings and love the variety of exercise you do. I joined a 10k step challenge at work and I am now walking everywhere. So thanks for all the great advice and continued success with your writing and the bakery! I’m a follower! and I love your blog! I don’t feel like your pushing any products just stating your opinion! Plus I love those mugs from Anthro. This morning while I was reading your blog I had the TV on the cooking channel watching Food Crafters and Justin’s Nut Butter was on! He seems very cool and I love his products. I don’t know if you watch that show or are even interested but I thought of you when I saw it and thought you might be interested. They usually re-run the episodes so maybe you could catch it on later. Congrats on the article write up of GH !! I love the pic they used!!! lol, so cute! I would seriously pass out of happiness if I won the Vitamix!!!!!!!!! omg! Such an awesome giveaway!!! 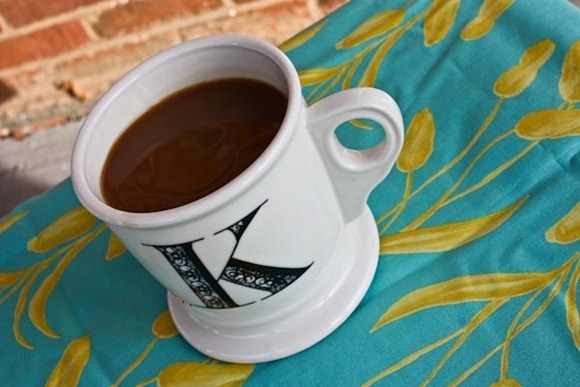 Love the ‘K’ Mug ! I need one! Open sky is so so sooo good to your readers! I’m glad I am a follower! Whenever I get married, I hope to keep my last name too. Love to see strong women keeping their last name! 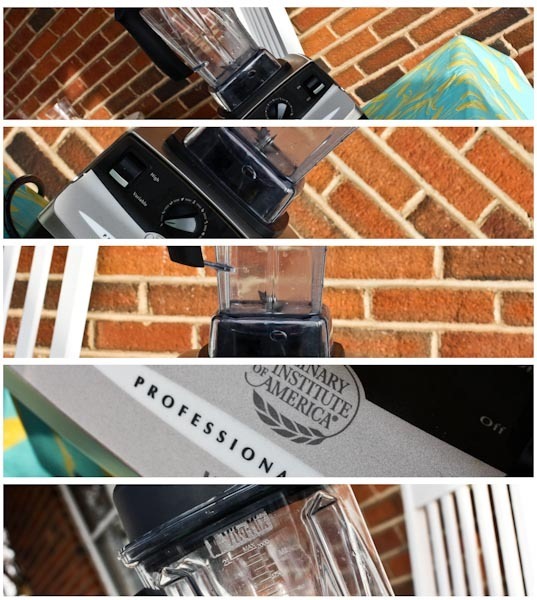 I need to win this vitamix! that article is too cute! I want to taste great harvest bread so bad! ooh, I see changes on your site! very cool! What I want to know is where can I get a I Eat Real Food tshirt!? I can’t wait to get a Vita-Mix someday! Oh me, oh my. I could use a vitamix in my life. If not now, then I plan on saving up and buying one for my graduation gift to self. Just started following you on Open Sky last week…providence I hope?? Been coveting a Vitamix for about a year now. Just can’t justify that $$ on a blender when I have 2 kids in school! Caffeine effects me so much too! I have any past noon I have such trouble sleeping. 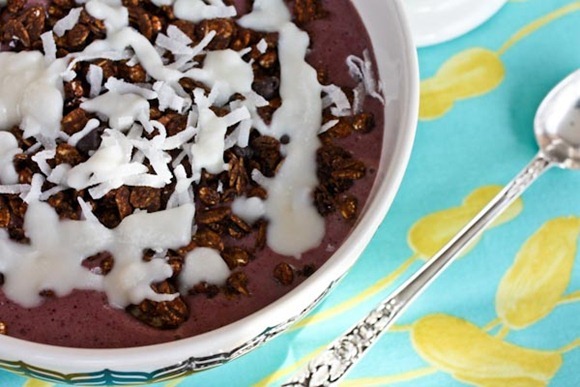 That smoothie looks like it would make an awesome dessert as well! I bet that smoothie baked would be amazing! Cool giveaway, as per usual! Bummer that we do not have a Whole Foods close to us. While I am not fond of the prices, it’s the variety of good foods available that I wish we had. I am going to look at the freezer section of our market for frozen greens. I want to make that soup! I am also excited about that Vita-Mix. Oh gosh I really am. I have been wanting a vita mix forever! i am officially praying to the vita mix gods!! awesome giveaway!! Vita mix, Vita mix, come to me in my dreams or Friday will be fine too! I think you should have a “I Eat Real Food” tee-shirt giveaway! I want to buy one but can’t decide on the size to choose. I think I should just choose a M and eat less if it’s too small. Soon I’ll be on a trip with a Trader Joe’s- anyone that wants to give suggestions I should buy would be wonderful! I’m thinking about making some new shirts soon! Trader Joes favs are sunflower butter, peanut butter, cinnamon almonds, salty peanuts, smoked herring, smoked sardines, big slab of dark chocolate, nuts over raspberries trail mix! Your SIAB looks delicious! 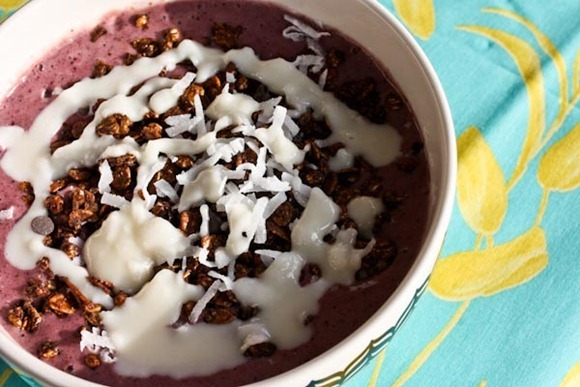 I need that vita mix – I’ve been coveting one for a LONG time! Would love to win. I’m glad I followed – I recently purchased the FUL bag and was amazed how fast I got it. Would love to see husband KERF on OpenSky for home brewing products and ingredients. Speaking of homebrewing – have you ever tried to do anything with the beer sediment/trub? I’ve baked a couple of times with it, and will usually try to throw ingredients (cherries, cacao nibs, etc) from the boil or from the bottom of the carboy post transferred fermented product to bottle/keg into loaves of bread or other baked goods just for fun. Would love to hear if you or your husband have ever tried this? Home brew stuff would be fun, but I’m not sure there’s a demand for it since my audience is mostly female. You know more about it than I did with terms like carboy 🙂 I’ll ask Matt to read your comment. You’d be surprised to hear that I’ve never done any cross-over between brewing and baking besides making beer bread. The thing I’d be most interested in would be spent-grain bread but after the mash the grains are so bland that you’re really only putting them in bread for some texture. But beer bread is really fun, and I don’t mean the kind with baking soda/powder – I’m talking about yeasted beer bread. You can pretty much take any bread recipe and substitute beer for all the water and it’s delicious. In March at Great Harvest Charlotte we brewed up an Irish Dry Stout to make Stout and Gouda bread. It was AMAZING compared to the version we made with Guinness. So flavorful. I, as one female, would love more posts on home brewing! I appreciate the reply! I really enjoy this blog and I like when quality beer (pumpkin or moose drool haha) pops up around here. My boyfriend and I are fairly new to brewing, going on about 6 months now since our first initial brew, and we’ve really enjoyed the whole learning process. Our “on the side baking” experiments are done to supplement our knowledge of the chemistry behind the beer and just to try out crazy things we hear about on brew forums or from books. Right down we are just brewing from kits, but have been busy researching recipes and scouring all resources to start doing most the process from scratch. None the less, we learn something new every time we brew. The Stout and Gouda bread sound stellar – y’all should also try some cherry stout brownies! I think any sweet, caramel amber ale with white sharp cheddar would pair well when topped with a granny smith apple and possibly some almond butter…. But I am so sincerely excited for the y’alls GH success. We have a GH near by, but I love the mission of the company and support smaller operations. I always enjoy reading updates and wish the best of luck. If and when I make my way through Charlotte, I will hopefully be stopping on by! Whoaaa bessie, a VitaMix?! Holy WOW I’m excited for this giveaway!!!! Personally I’m not going to change my last name when I get married. My last name is part of me and heritage and I want to keep that. already following you and how cool that you’re giving away a vita! a few years ago, I changed my entire name, first, middle and last. Never liked my given name, so i changed them all. And changed our daughter’s last name to my last name. I took my husband’s last name. He asked me too..but the choice was completely mine, and he would have been ok with it if I had kept my maiden name. What I HATE though…is when people address things to me as “Mrs. Husband’s First and last names” like “Mrs. John Smith.” MY name isn’t JOHN! Funny because Mrs. Matt Monson doesn’t bother me! It’s like saying I’m the wife of Matt Monson, which is true. But Katherine Monson is completely untrue. I’m anti-Mrs. in general. Men’s titles don’t indicate marital status, why should women’s? Plus the lack of a first name for the woman bothers me – what, we get married and lose our identities? That IS funny that it doesn’t bother you when Monson isn’t part of your name at all! No way!!! Oh my gosh Kath – what an amazing giveaway. Wow. Going to “like” you now. I had a SIAB today too! I would LOVE to win the vitamix -my fingers are crossed! Dannng – look at all these amazing giveaways!! Great new footers!! thanks for the inspiration! I’ve been teaching myself wordpress, the technical stuff can get complicated! Love the opp for a Vita-mix! Been wanting one for so long! You’re recipes are inspiring and I’m addicted to my oatmeal now! I miss it in the mornings when I don’t get to have it. Had my first taste of GH bread last weekend – the honey wheat was amazing! I enjoyed it toasted with a small smear of honey butter. Thanks for the Trader Joe suggestions. And I like to hear about beer making even though I don’t brew. Today’s weather was wonderful- doesn’t everyone feel happier Today!! I made this for lunch today and me and my hubbie loved it! That coconut butter shell is to DIE for!!! What a great idea! I took my hubby’s name 6 years ago, and I will still catch myself telling people my maiden name. It’s kindoff hard to change something you were given from birth. I was wondering if you love your vita-mix? I’m trying to convince the hubby and want to make sure it’s amazing before spending that much money. Since we seem to cook and eat similar I thought you would be a great person to ask!